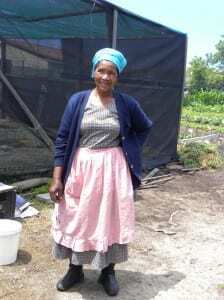 Backstory: Harvest of Hope is the only community supported agriculture program in South Africa. The organisation has contracts with farmers to grow certain organic produce which is then sold weekly in boxes to demanding customers. The goal of the organisation is to show the potential for feeding a family on a small plot of land while simultaneously providing healthy vegetables to families in Cape Town. The organisation has grown from 80 orders per week in 2008 to 380 boxes per week today. Cast of characters: In order to maximise the benefits of this trip, we invited various members of the MGV community as organised by Ronell. In total, there were nine of us who attended. Bob Hersh, our advisor attended along with Sarah and Shahbaz from our team. The remaining were MGV residents; Shaheed is very interested in starting his own business through growing vegetables and has proven himself extremely knowledgeable about gardening, Clive tends to Ronell’s home garden and was relatively quiet on this trip, Kirby maintains the crèche gardens and has plans to expand them along the perimeter of MGV, his granddaughter was with him for the day, Melvin is an ex-prisoner who aspires to help youth find their purpose in life before they are in their late twenties, and Ronell came ready to ask questions and learn from this experience. Rob Small, the leader of Harvest of Hope, led the tour giving much information on gardening and projects. What is the difference between contracted gardens and the non-contracted ones? How much does a garden have to produce to be eligible? How far can these gardens be located from the distribution centre? How much are these boxes supposed to feed? How frequent are the pick-ups? Do farmers cover their own expenses? What about pick-up? Is there a criterion for what they have to produce? How does the farmer/distributer payment process go? How are new gardens contracted/recruited? Is there any training and how long? Is it free? Do these gardens participate in any other program? Do they sell themselves or provide education to communities? Is this allowed? Does the farming generate the whole income of the farmers? The day began with some confusion about the individuals who would be attending this visit. Unfortunately, the WPI member from the Mtshini Wam project and another community member could not make the trip as planned. When the bus arrived in MGV, there was no one to be seen who would be coming with us. With time, a few individuals gathered with Ronell but Shaheed, who said he would definitely be coming, was not present. We went to his house to find he was only running a little late but was ready to follow us in his car due to a need to leave the meeting early. Shahbaz rode in the separate car with Shaheed to start a conversation with him. During the ride with Shaheed, Shahbaz was able to discuss with him the goals of our project and the potential role of agriculture along the pathway. Through their discussion, Shahbaz found that Shaheed possessed a wealth of knowledge regarding gardening and agriculture, everything from seed saving to compost to cultivation. As an experienced gardener, he seemed very motivated to start a business selling fresh produce to local restaurants. He also had a good sense of the need for a larger community garden so as to accommodate more gardeners and help stimulate people’s interest in gardening and develop their skills and experience. After a quick grouping at the BP garage in Wynberg to meet with the tour, Rob Small led us to the contracted Guguluthe garden where he gave a brief history of this project. Rob explained that though this garden is successful, it is actually considered under-producing by Harvest of Hope’s standards. The reason being is that the six older women who run the garden do not want to hire more help, as they see others, especially youth, as lazy and do not want to waste their hard earned money on paying them. What they do not realize is the larger picture, at least according to Rob, that hiring a couple more hands would increase their production and allow them to be even more successful than they have been. He explained that often the farmers he works with are stuck in their ways and will not budge until they begin to see someone else becoming successful as a result of modifications in their farming or organisational methods. He stressed the idea of biodynamic agriculture, an organic and holistic view of farming, being the ultimate goal for all their farmers, but he also noted that it is hard to get farmers completely onboard with the idea. 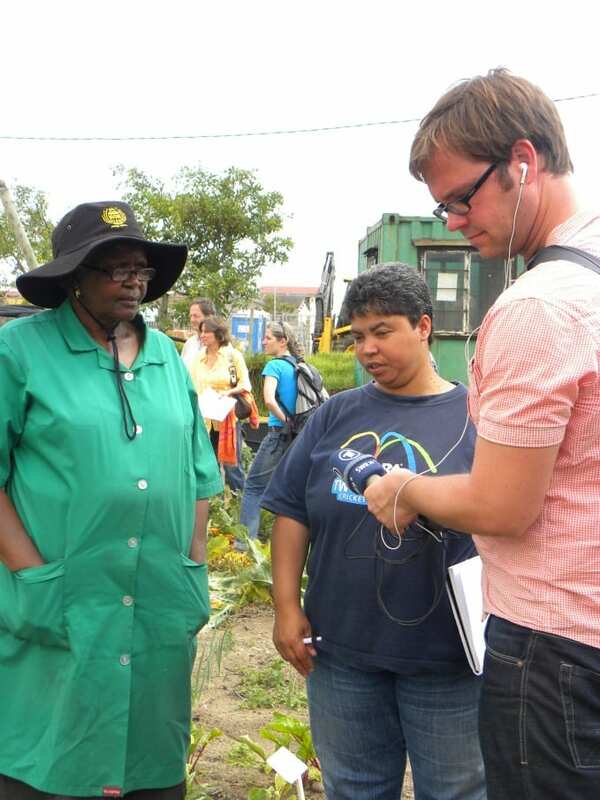 While Rob spoke, the German journalist interviewed one of the women from the garden as well as Ronell. Meanwhile, Shaheed was really interested in the farm and how they irrigated the vegetables with water reservoirs, pumps, and a network of irrigation tubes. He asked Rob some very prescient questions and even made suggestions about how to improve the farm, all of which impressed Rob very much. Rob voiced that Shaheed would be a great leader for a community garden and business in Maitland Garden Village based on the amount of agricultural knowledge he displayed. As we departed for the next location, Shaheed had to leave due to prior engagements. The next location we visited was the packing and distribution centre for Harvest of Hope. This is where the produce from all the different affiliated farms is processed and packaged into boxes weekly ready for pick-up and distribution. 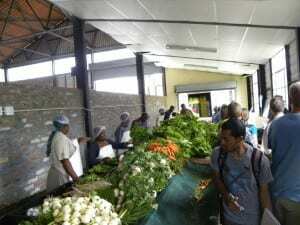 It was great to see how streamlined and efficient the process is and we also learned that Harvest of Hope supplements the vegetable boxes with eggs and produce from other local farms as needed. Having only been running since 2008, the packing and distribution process is very well organised. As a whole, Ronell was very impressed and excited at this point and it seemed to give her lots of inspiration for Maitland Garden Village’s own plans for a community garden and business. Our last stop was at the Harvest of Hope training garden, where many of their affiliated farms begin. As we entered the garden, Rob showed us a small vegetable plot that was an example of a garden that a family of four or five could live on from week to week. Rob introduced us to Mama Bokol who runs the garden and had the German journalist interview an extremely motivated young man, whom he seemed very impressed by. Rob made it clear that Shaheed and Kirby may become important people for the community garden, as they each have a significant amount of knowledge and interest in gardening and agriculture, while Ronell may play an important administrative role. The day began with some disappointments since our group was about half the size we had hoped for. Additionally, the car ride to our first destination was supposed to spark a discussion about a business plan but instead was dominated by the prison culture in South Africa. Despite the beginning, this trip was really exciting and well-worth the visit to Harvest of Hope. Not only was it an opportunity to meet those involved in the CSA, but another chance for us to expand our relationships in MGV. Kirby was an inspiring individual who seemed like he could spearhead some sort of agriculture development since he already tends to the crèche gardens. Additionally, it was inspiring to see he did this at his own expenses and did such a lovely job. Shaheed is also another individual who could spearhead an agricultural business. Rob Small even said that Shaheed would make a good official to provide the technical and skilled side of the gardening. It was also really nice seeing Ronell so interested and engaged in this visit. She was constantly writing notes and asking questions about agricultural opportunities in MGV. Rob Small said that she, with the Green Light Project, could make a promising managing force in a community garden. Overall, many ideas and suggestions were given and there is a promising horizon for our proposal for agriculture business. Meet with Shaheed and other members who would be interested in an agriculture business. With them, start laying out the framework for a business plan, incorporating the suggestions from Rob Small. Compile a list of all the necessary resources for community gardening. Reconstruct our proposal outline as necessary.